Welcome to the new website of Drumahoe Primary School, a medium sized school of approximately 250 pupils. 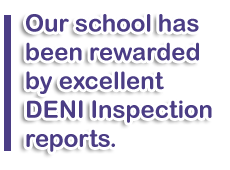 We are very proud of everything that goes on in our school and have been rewarded by excellent DENI Inspection reports . This follows on from the school achieving the prestigious Investors in People Standard in June 2004. Drumahoe Primary School has been serving the Drumahoe community and beyond since 1934. We maintain a proud academic record , along with a reputation for providing opportunities for every child, irrespective of religion, race or creed, to discover their true potential and experience success. The new millennium has brought new opportunities to the school, to its pupils and to the community it serves through a complete re-development of our campus. Our new website will give you just a flavour of life at our school. It is our belief that every child matters and we consider it a privilege when a parent entrusts his / her child to our care. The website provides us with another opportunity to celebrate the success of our children and share the learning experiences they have had with a wider audience. We are extremely proud of our children, our staff and our school, and hope, that in exploring our website, you get a flavour of many aspects of school life and the excellent work of our children, our staff and our parents. In addition, our website is a place where you will find information about the school, its location, events, term dates and current activities. Overall, the website is the result of a concerted effort by all at the school to provide as much information as possible to those who visit the site for whatever reason. Regular updates and maintenance keep it topical, and our thanks are due to all those who created and continue to maintain the site. I encourage you to explore our website where you will find out about various aspects of life in school fulfilling our mission statement which is to …..